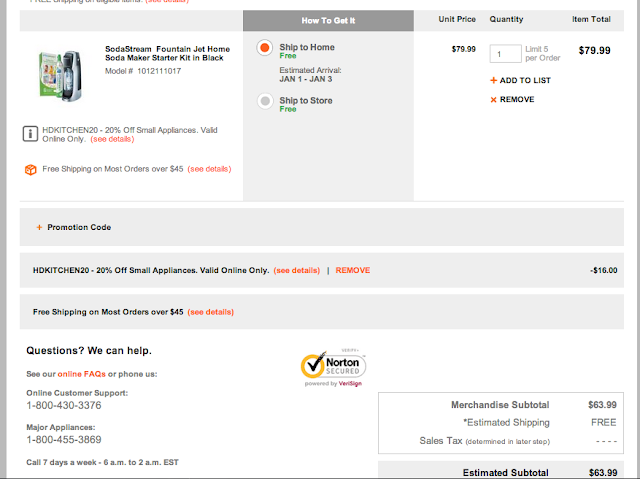 Update: See below that you might be able to get the Sodastream from Home Depot for $38.99, but it is a gamble. Sears is selling the Sodastream kit for $80 but the price drops $25 to $55 with this mail in rebate from Sodastream. I bought mine with a mail in rebate and they fulfilled it without any problems. The rebate says it must be from a retail location so it probably will not work if you buy it from Amazon. The rebate says that if you use any promo codes it nullifies the rebate so use promo codes at your own discretion. You will also earn $2.40 in Shop Your Way points to use on a future purchase. Start your purchase at from Ebates and get 6% cashback as well. You will still get your normal cashback from your credit card as well. Don’t have ebates? Sign up here for free. Pay with your Discover card and you will get 5% off any online transactions. 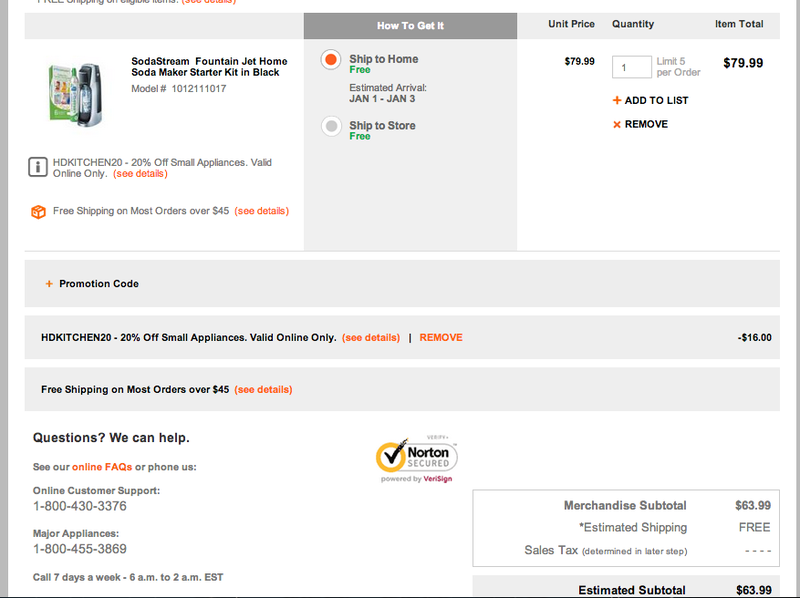 Alternatively, you can buy it from Home Depot and use coupon code HDKITCHEN20 to get 20% off. The problem is that if you use the coupon code, the rebate may be nullified. Buyer Beware. If everything works, it will 63.99 after the coupon code. Then the rebate will take it down to $38.99. Use Shop Discover for 5% off. If you pay with your Discover card you will get another 5% off any online purchases for 10% off or $6.39 off. Your final price will be $32.60. This all assume you will get the $25 off from the rebate which is anyone's guess. From Home Depot you can get free shipping to your home.